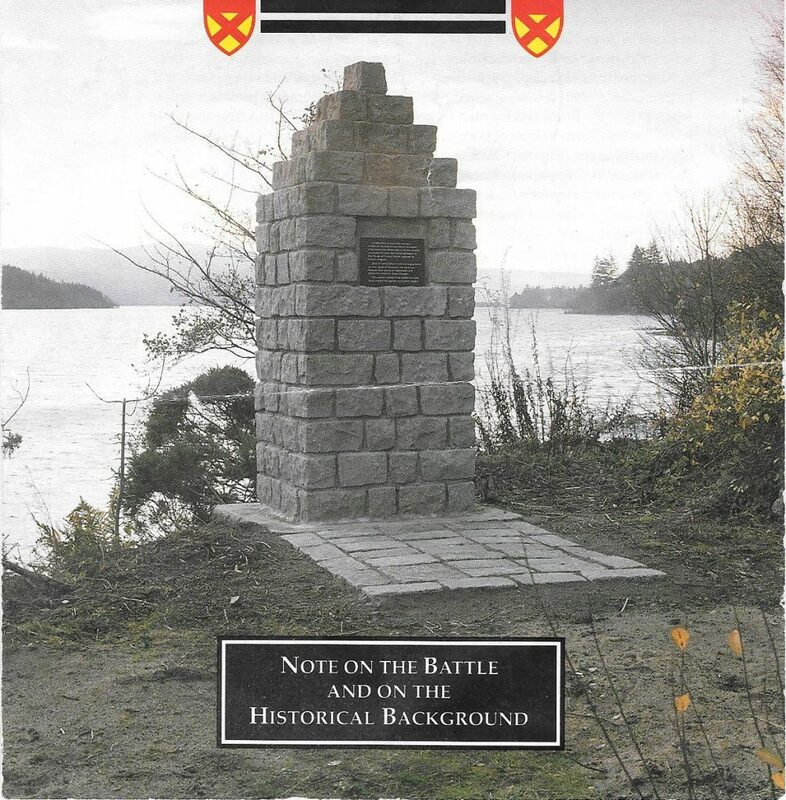 The Battle of the Pass of Brander was a small part of the Wars of Scottish Independence, and is known as a vital part of the civil war between the Bruce and Balliol factions. The MacDougalls of Argyll were kinsmen of John Comyn, also known as the Red Comyn, through marriage, and were thus allied with the Balliol faction. Robert the Bruce stood against the Balliols, and participated in the killing of John Comyn on February 10th, 1306, before the high altar of the Greyfriars Church in Dumfries. This slaying was a decisive act in Scottish political history, for soon after the Bruce was crowned with the full support of the Scottish Church. Despite this, Robert the Bruce now faced formidable obstacles in the form of internal struggle. With the murder of John Comyn, his extensive network of family and kinsmen agreed to fight on the side of the English against Robert the Bruce, whom they considered to be the greater threat (or evil). These people controlled large and strategically important lands throughout the realm; in Galloway, Lochaber, Atholl, Ross, Buchan, as well as Badenoch and Strathspey. Much of Argyll was under the control of Alexander MacDougall, the Lord of Lorne, who had been related to John Comyn by marriage. Soon after the Bruce was defeated by the English at the Battle of Methven, what was left of his army was decimated by Alexander’s son, John of Lorne, also known as Iain ‘Bacach’ (the Lame), at the Battle of Dalry near Tyndrum. Bruce narrowly escaped capture and was forced into hiding. Robert the Bruce recovered from these disasters and descended on Ayrshire in the spring of 1307 to begin a guerrilla war, fighting against both English military strength and an internal resistance. There was a bit of luck involved, as Edward I of England died on the way north to truly begin his campaign, which left Edward II, his son, in control of the military. Edward II turned his attention to English domestic politics instead, and left the Scottish allies to manage as best they could. The Bruce’s first attack came in September of 1307 in Galloway, the hereditary home of the Balliols, against the MacDowalls, the powerful feudal family then known as the Macdougalls of Galloway, and the Macanns. It was said that the fighting was so fierce that the local peasantry took refuge over the border in Cumberland. The chief men in Galloway appealed in vain to Edward II for help, and were forced to pay tribute to the Bruce in return for a truce. Robert the Bruce then turned his attention to the north, breaking through the English-held Lowlands and heading for the Red Comyn’s old stronghold in Lochaber. This march into the Highlands was supported by a fleet of galleys sailing up Loch Linnhe. John Bacach, acting for his elderly father, asked for a truce, unable to face the full force of this combined attack. The Bruce then went north-east to settle concerns with his principal enemy, the Red Comyn’s cousin and namesake, John Comyn, the 3rd Earl of Buchan. This campaign lasted through the winter season, with the climax taking part at the Battle of Inverurie in May of 1308. The Bruce was now at liberty to turn his full attention back to unfinished business in the west. Alexander MacDougall, too old and sick to take part in the fighting, lay in his castle at Dunstaffnage. John Bacach was left with preparing and dealing with the expected onslaught to come. 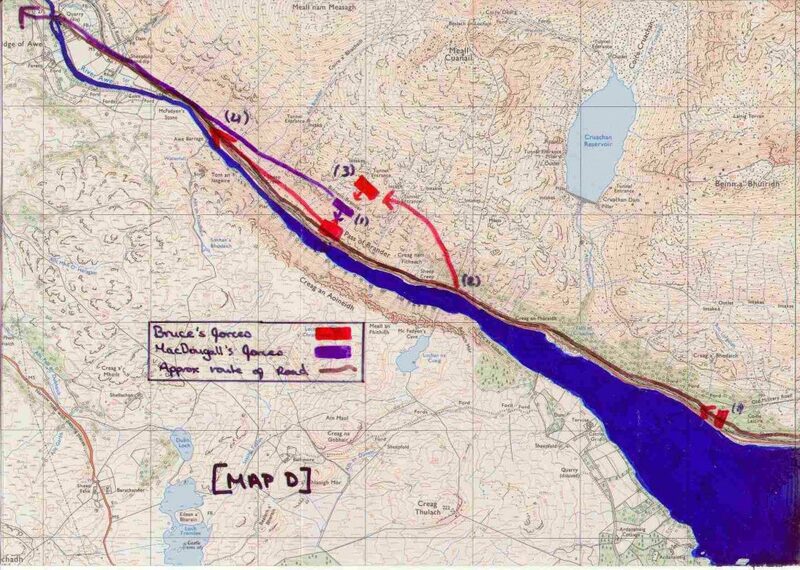 In the summer of 1308, his army took up position in the narrow Pass of Brander, where the River Awe cuts through the southern slope of Ben Cruachan on its way down from Loch Awe. John, who was recovering from an illness, observed his dispositions (the placing of his forces) from a galley on Loch Awe. His men were hidden in the hillside, overlooking the narrow path through the pass. A party of Highlanders loyal to the Bruce, commanded by Sir James Douglas, climbed even higher up the mountain and positioned themselves at the enemy’s rear. As the MacDougalls attacked they were caught in a vice, with Robert the Bruce coming from below and the Black Douglas from above. The men of Argyll were eventually broken, and were chased westwards across the River Awe back to Dunstaffnage, while John Bacach escaped down the Loch in his galley, eventually taking refuge in England. The Lord of Argyll surrendered and paid homage to Robert the Bruce, but left the following year to join his son in exile.